Cotton is a seed fiber, meaning the fiber grows from seeds. It is perhaps the most important of all fibers. Cotton is the most important natural textile fiber, as well as cellulosic textile fiber, in the world, used to produce apparel, home furnishings, and industrial products. Worldwide about 40% of the fiber consumed in 2004 was cotton. Cotton fibers are seed hairs from plants of the order Malvales, family Malvaceae, tribe Gossypieae, and genus Gossypium. Botanically, there are four principal domesticated species of cotton of commercial importance: hirsutum, barbadense, aboreum, and herbaceum. Thirty-three species are currently recognized; however, all but these four are wild shrubs of no commercial value. 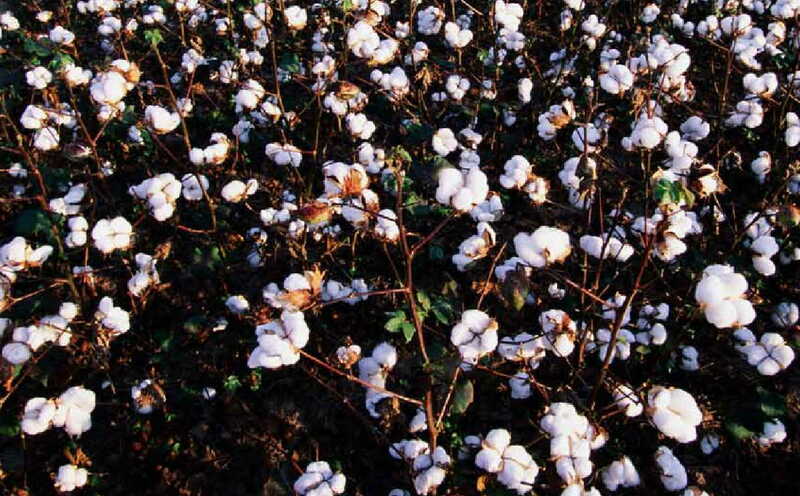 Each one of the commercially important species contains many different varieties developed through breeding programs to produce cotton with continually improving properties (e.g., faster maturing, increased yields, and improved insect and disease resistance) and fibers with greater length, strength, and uniformity. The cotton fibers used in textile commerce are the dried cell walls of formerly living cells. Botanically, cotton fibers are trichomes or seed coat hairs that differentiate from epidermal cells of the developing cottonseed. The cotton flower blooms only for one day and quickly becomes senescent thereafter. On the day of full bloom, or anthesis, the flower petals are pure white in most hirsutum varieties. By the day after anthesis, the petals turn bright pink in color and, usually by the second day after anthesis, the petals fall off the developing carpel (boll). The wild cotton plant was domesticated in Asia, Africa, and South America nearly six thousand years ago. Ancient Egyptians made fine cloth at least four thousand years ago. Their hand-spun cotton was as fine as for today’s best. Today, cotton is grown on 77 million acres in over 80 countries – anywhere the growing seasons are long and hot. Cotton grows on bushes that are three to six feet high. Its flowers last for five to seven days. The boll is a seedpod about the size of a golf ball. It begins to grow after the flowers drop off. Inside are 7 or 8 seeds, and attached to them are the cotton fibers. Each seed may have as many as twenty-thousand fibers – that’s as many as one hundred fifty thousand individual fibers in each boll! Cotton is threatened by the boll weevil. It’s a beetle feeds on bolls and the blossoms. Each year the weevil causes around two hundred million dollars of damage to the cotton crop in the US alone. So cotton is treated with insecticides, often by airplanes. Cotton is a seed fiber and grows in warm climates. Modern harvesting of the cotton crop is highly mechanized. Cotton is a good choice for clothing for its comfort and easy care. Long staple cotton (such a Supima, Pima, Egyptian, and Sea Island) can be woven into smooth, almost silky fabrics.